What unites consumers? Basic need. What sets consumers apart? Customization and personal preference. PepsiCo has released a brand that speaks to both of those. Introducing LIFEWTR. Purified, premium water in eye-catching, vibrant bottle designs. Did you catch the Super Bowl commercial announcing the brand’s debut? Catch that here – and read on to see how LIFEWTR is different, and why consumers will rave about it. 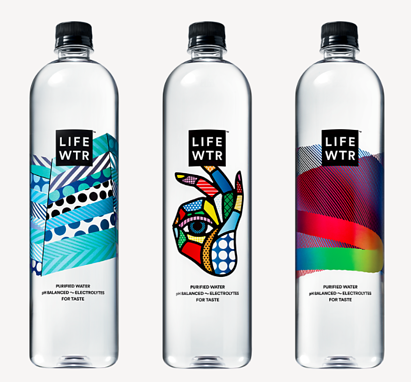 The LIFEWTR brand will appeal to the growing consumer interest in healthier beverages. Convenience isn’t going away and neither is the trend toward cleaner, more sustainable food and beverage items. There’s another element at play with LIFEWTR that will further appeal to the target demographic – the millennial. The LIFEWTR tagline says, “We exist to advance the sources of creation and creativity. Refresh your mind and restore your body.” Life. Water. Inspiration. The labels will be curated by individual artists and changed out on shelves every three months. The first bottles are called Series 1 and feature a partnership with Jason Woodside, Craig & Karl, and MOMO, and the first series explores artists who create vibrant art for public spaces. LIFEWTR features the artists’ stories on YouTube - LIFEWTR and exists as a canvas for artists worldwide, showcasing their work on every bottle. Since 2004, bottled water volume has more than doubled from 1.8 billion cases to almost four billion in the past year. Why? Consumers have always known hydration is key to health and wellness, so why the boom? It’s become the fastest-growing beverage market in the world, and it’s thanks to innovation and changing consumer preferences – half of bottled water drinkers say they’re drinking more flavored water to replace or occasionally swap out soda or sugary beverages. Consumers, especially the key millennial generation, will continue to justify and choose to purchase ready to drink beverages considered premium offerings. Why do consumers drink water? There are five key reasons. Relaxing routine – and premium water speaks more to an intentional practice or habit. Replenishment – the importance of water has been instilled in consumers their whole lives, and this remains the biggest reason why they turn to water. Meal enhancement – reaching for a complement to meals, whether savory or sweet. Active performance – electrolytes and added nutrients can energize and uplift people in times of strain, training, and performance. Guilt-free fun – water is a healthy choice, bottom line. And with the great brands and portfolios now available, even more options exist. 2017 will continue the trend of consumers expanding their options when it comes to premium offerings, healthier products, and choosing convenience as a motivational factor in selection. LIFEWTR hits on those cylinders specifically while committing towards activism and support of the arts on a national scale. It's a brand that's sure to unite and inspire consumers!